Reusable ear plugs can be cleaned after use and used many times before they need to be replaced. Reusable ear plugs are the most expensive kind of ear plugs to buy, but they can be less expensive to use over time because they last longer than other types. Reusable ear plugs are uniformly rated lower than foam ear plugs, however many times reusable earplugs offer better protection in practice than do higher rated foam earplugs because reusable earplugs are generally easier to insert properly. 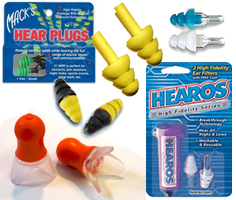 On this page you will find a comprehensive listing of all our consumer reusable ear plugs, arranged generally from highest cost to lowest. TIP: If you are a frequent ear plug user, you may already know that many consumer ear plugs are identical to an industrial ear plug that goes by another name. Consumer reusable earplugs are packaged for distribution in stores, and many also include carry cases and more information about the product. If you use many ear plugs, you can see substantial savings by investigating our industrial reusable earplugs as well. (NRR 16) Industrial Safety Earasers are hi-fi hearing protection for industrial environments. Earasers provide hearing protection while preserving clear hearing, they are extremely small and low-profile, and they feature a smooth surface that won't make your ears sweat or itch. (NRR 16) Industrial Safety Earasers are hi-fi hearing protection for industrial environments. Earasers provide hearing protection while preserving clear hearing, they are extremely small and low-profile, and they feature a smooth surface that won't make your ears sweat or itch. Includes lanyard.